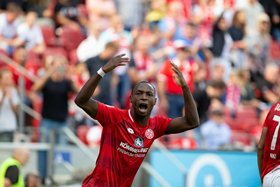 Anthony Ujah's purple patch in the new season continued on Saturday after netting for his second consecutive game in the German Bundesliga as Mainz 05 came from behind to beat Augsburg 2-1 at the OPEL ARENA. The former Lillestrom hero returned to German football in the second half of last season in his bid to gatecrash Nigeria's World Cup roster but failed to score in 11 appearances in the league. Ujah has not taken time to find his form this term and he's definitely pushing for a spot in the starting line-up after coming off the bench in the 73rd minute before scoring a crucial equalizer with three minutes remaining. The 27-year-old bundled the ball into the net after a free-kick floated into the box was not properly cleared by the Augsburg defense. The super-sub netted the game-winning goal for Mainz after entering the game as a substitute on the opening day of the season against Stuttgart. Ujah has not played for the Super Eagles since September 5, 2015 in an Africa Cup of Nations qualifier against Tanzania.